Matt graduated from Gordon-Conwell Theological Seminary with a Master of Divinity and a Master of Arts in Counseling with dual concentration in Mental Health and Marriage and Family Therapy. He has gained extensive clinical experience working in both church-based and community-based counseling centers and providing a wide variety of modalities, including individual therapy, marital and family therapy, group therapy, therapeutic mentoring, and wraparound services. Prior to this, Matt worked in full-time youth ministry, young adults and small groups ministry, and church planting for over five years. His general approach to counseling integrates aspects of cognitive-behavioral therapy, interpersonal and communication skill building, family systems modeling, and spiritual formation with specific focus on developing spiritual practices that fit with a client's particular needs and readiness. Above all, Matt is committed to partnering with clients through empathy and encouragement so that they might come to understand and take hold of the transforming truths of the gospel in the deepest parts of their lives. Dan holds two master’s degrees; a Masters in Theology and a Masters in Mental Health and Marriage and Family Therapy from Gordon-Conwell Theological Seminary. He has over 15 years of experience working with men and couples in ministry settings and has a bachelor’s degree in Business Management with minors in History and Communications from the University of Nebraska Lincoln. He has been working as a therapist for the last 5 years and believes a strong rapport with his clients is critical to the therapeutic process. Change will sometimes be easy and swift, but more often it will be slow and potentially frustrating. Remembering and resolving significant life events in therapy can bring on strong feelings of anger, sadness and fear, but if trust and rapport are strong, Dan believes that together you can wade through these milestones as they come together. Megan graduated from Gordon-Conwell Theological Seminary with a dual degree in Mental Health Counseling and Marriage and Family Therapy. Over the past six years, she practiced in a wide variety of positions ranging from college campuses to crisis-based residential programs and outpatient clinics. Megan has served as a Clinical Director and also has been on assessment teams related to crisis intervention, safety planning, and harm reduction for DCF-funded programs. In these positions Megan has drawn upon experience working with clients of all ages as well as families, couples, adoptions, foster homes, and court-ordered mandates. Megan has gained extensive clinical experience working with a variety of clinical concerns including trauma, suicidal ideation, relational conflict, anxiety, depression, substance use, transitional issues, and eating disorders. Megan works from an eclectic approach that draws on evidence-based modalities such as CBT. As a provider, Megan is passionate about the health and well being of every client with whom she works. She advocates for a holistic stance on mental health, taking into consideration physical and spiritual concerns that her clients may present. Day began her journey toward counseling while working alongside her youth pastor husband in Oregon. This work solidified a desire to encourage individuals through the trenches of life. So, after completing her undergraduate degree at Multnomah University in Portland, Oregon, earning a dual degree in Bible & Theology, and Family Ministry, she moved to Massachusetts where she completed her Masters of Arts in Counseling at Gordon-Conwell Theological Seminary, with a focus on mental health counseling. Since graduating, Day has worked extensively with clients with substance use disorders and their families. Most recently, she served as the Clinical Director at a large, residential facility that oversaw treatment of individuals with co-occurring disorders such as post-traumatic stress disorder, anxiety, depression, and a multitude of stressors such as grief and loss, DCF and legal involvement, relational difficulties, anger management challenges, and self-esteem issues. Day’s heart is to use gospel truth to offer hope, comfort and direction to individuals seeking wholeness and healing. This, coupled with sound, evidence-based treatment modalities, such as Cognitive-Behavioral Therapy, Motivational Interviewing, and some Dialectical Behavioral Therapy skills, create a treatment environment where real change can happen. Christina graduated from Gordon-Conwell Theological Seminary with a dual Master’s degree in Mental Health Counseling and Marriage & Family Therapy. She has practiced in a wide variety of settings including crisis pregnancy centers, public schools, in-home therapy, and outpatient clinics. She has extensive experience counseling culturally diverse populations and has collaborated with several divisions of the Department of Health and Human Services. 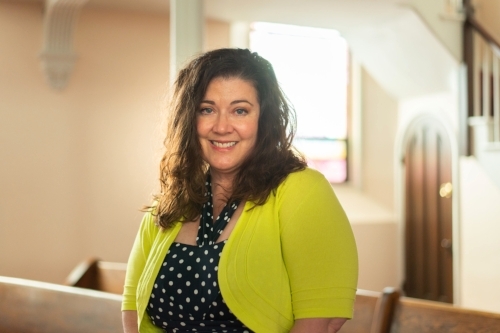 Over the past ten years, Christina has worked with students in youth and college ministries, and she continues to address mental health concerns in the church. As a counselor, Christina embraces a relational, directive style and seeks to empower clients to be active agents in their journeys towards healing, growth, and change. Christina integrates evidence-based treatment modalities such as Cognitive Behavioral Therapy and Dialectical Behavioral Therapy with gospel truths. She also utilizes psychodynamic, narrative, and holistic techniques in her clinical approach. Among her interests are mood and anxiety disorders, trauma, women’s issues, and spiritual formation.